ESG Lab Review: Parallel Streaming from Veritas. 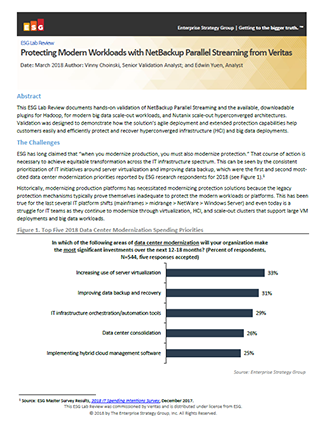 This ESG Lab Review documents hands-on validation of NetBackup Parallel Streaming and the available, downloadable plugins for Hadoop, for modern big data scale-out workloads, and Nutanix scale-out hyperconverged architectures. Validation was designed to demonstrate how the solution’s agile deployment and extended protection capabilities help customers easily and efficiently protect and recover hyperconverged infrastructure (HCI) and big data deployments. Thank you for your interest in the ESG Lab Review on Parallel Streaming from Veritas.